The starting point for a Syriza Government will be for 50% of Greece's debt to be written off, I say a starting point because it will be a perpetual revolving door of never ending write offs as further Eurozone / ECB loans will every so often be subject to further write offs, just as when Greece had the Drachma and used to print as much money as needed that caused persistently high inflation. So by printing euros for Greece German tax payers will be subsidising Greece in perpetuity through the Inflation it causes. However, this would be just the tip of the Eurozone crisis iceberg for any Greek debt write off will soon trigger similar demands amongst other debt ridden PIIGS nations and thus fracture the euro-zone. Greece threatening a unilateral debt default that would result in Greece being kicked out of the the Eurozone is set against the fact that opinion polls repeatedly state that 75% of Greeks do not want Greece to exit the Eurozone. So it is not black and white that Syriza will actually deliver on its debt default threats. The truth of Greece's debt situation is indicative of the fundamental flaw right at the heart of the Eurozone which is that Greece has no choice but to borrow form the Eurozone to pay interest on eurozone debt and the eurozone as long as it is deemed politically expedient to keep Greece within the Eurozone then will continue to loan debt to Greece to pay interest on Eurozone (ECB) debt. This is a perpetual debt infinity loop because of the fundamental flaw for the lack of a proper mechanism for TRANSFER payments within the Eurozone, much as takes place in every member state where the governments make transfer payments (government spending) to SUBSIDISE the less affluent, less economically capable regions. Furthermore, the truth is that Germany and the ECB is in large part to blame for the current crisis for the Troika's (ECB, IMF and EC) policy has always been one of kicking the can down the road through the mantra of austerity being necessary to to reconstruct the Greek economy into an exporting economy that would deliver economic growth. The flaw here is that as a consequence of being in the Eurozone Greece cannot compete against Germany or any of the other low tax eurozone nations such as Ireland, so is stuck in a downward spiral. The calculations being made at the ECB is to whether use of more smoke and mirrors to hide further subsidies to Greece that in all but name would amount to a debt write off with more later, or whether now the euro-zone could survive a Greece Exit. The last time Syriza threatened to seize power in Greece was in Mid 2012 which put the markets on red alert for financial armageddon that triggered banks literally to start exploding across the euro-zone most notable of which was Spain's Bankia. Reuters has let the cat out of the bag Friday concerning secret panic driven talks concerning an imminent bailout of Spain's bankrupt banks, possibly as early as Saturday afternoon. Which follows fast on the heels of the credit ratings agency Fitch downgrading of Spanish Government bonds to just above junk status less than 2 weeks away from the contagion inducing Greek elections. All of which were contributing to what amounts to a state of Financial Armageddon in progress as a chain reaction of detonations takes place across the Euro-zone. 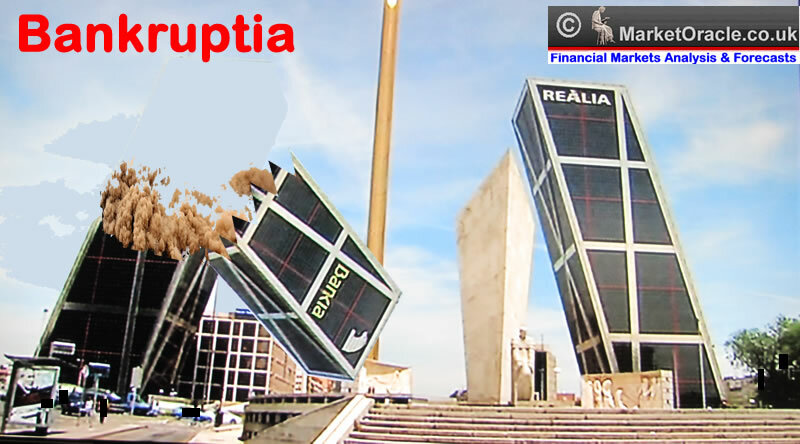 "Spain has so far resisted pressure to seek a bailout for its crippled banking sector. But sources say Madrid is now poised to ask for help. It's expected to apply for European funds over the weekend. That would make Spain the fourth - and largest - country to seek a bailout since the euro zone debt crisis began. Two senior EU officials say euro zone finance ministers will hold a conference call to discuss the aid package. " Meanwhile a whole host of Spanish Government Ministers have been busy all week denying that a bailout was imminent and that Spain did not need a bailout as they attempted to fight to keep their jobs as Spain would effectively follow Greece, Ireland and Portugal in giving up control of most aspects of their economy over to Germany. This time around with lessons learned the ECB has laid the ground work to cushion the immediate contagion consequences of a Syriza election victory on the Eurozone banking system under the cover of fighting deflation by announcing that the European central bank would print Euro 60 billion every month to a total Euro 1.2 trillion to buy mostly government bonds held by the banks (initially excluding Greece). This illustrates the degree to which the ECB feared the Greece Election results as it goes against virtually every statement made of the past 5 years that the ECB would not print money (QE). However given the crisis that the euro-zone will soon find itself in the rate of monthly money printing could easily double or even triple so that a couple of years from now the Euro-zone could have monetized as much debt as Japan has (60% of GDP, UK 25%, US 25%). Greece will effectively run out of money by the end of February, by which time if Syriza has made good on threats of starting to default on debt then the euro-zone will likely hold payment of the next tranche of bailout monies due by then of approx Euro 8 billion that could embolden Greece to threaten a default on total debt of Euro 250 billion most of which it owes to other euro-zone members (Euro 200 billion). Understanding fully that a total default would mean an exit from the eurozone that could trigger other highly indebted in permanent economic depression members such as Spain and Portugal to possibly also declare their intentions for an orderly default / exit from the eurozone. Additionally, Germany after 5 years of funding the Greek black hole has finally indicated that Germany would now be prepared to see Greece leave the euro-zone, so signaling that euro-zone would no longer bend over backwards to keep Greece within the Euro-zone. This will probably trigger a series of Euro-zone summits during the year where the terms for exit from the Euro-zone will be agreed upon. What is unknown at this time is whether Greece will also have to leave the European Union as the Lisbon Treaty implies. My opinion is that Greece will be allowed to remain in the European Union to salvage something from the unfolding chaos. In conjunction with the summits formulating the mechanisms for Greece and potentially others leaving the euro-zone there will be real world consequences for Greece in terms of the currency in circulation as a new currency would need to be printed and distributed (we may in the interim see vouchers or even photocopier paper currency used to pay public sector wages) causing chaos across Greece in terms of the standing of contracts such as Mortgages made in Euro's but no longer honoured in Euro's triggering a collapse of its banking system as no one will want to hold its new currency. This would result in a continuation of the slide of the existing Euro and a collapse in the value of the new currency (when eventually printed) potentially in the form of an hyperinflation panic event, i.e. we will see the Greek inflation rate soar as a consequence of Greece no longer being able to buy any goods or services from abroad due to the capital markets being closed to Greece. I had previously estimated that Greece could experience an annualised rate of at least 30%, which given the nature of the new government that would do nothing to address the requirements of capital markets could probably soar far higher amidst panic driven spike as any money left in Greece flooded out of the country before capital controls came into force. All of the weak euro-zone countries are waking up to the fact that they have been in a state of denial because they are NOT Germany they cannot compete against Germany that effectively holds a captured market for its goods and services, and therefore are only delaying the inevitable by remaining in a currency union with Germany that ensures their economies are also in a state of slow motion death spiral of economic collapse. In which respect they are in fact making the economic pain of their populations far worse as a consequence of dragging out economic collapse over many years if not decades rather than months as would have been the case had they had their own currencies and money printing presses such as that deployed by the UK that has successfully used smoke and mirrors inflation to mask the truth that Britain is in a far worse state in terms if indebtedness than most of the euro-zone countries that it has been busy monetizing (stealth cancellation). Greece exiting the Euro-zone would put immediate pressure on all of the other weak Euro-zone members, with Spain and Portugal the next targets for exit as a consequence of these countries being on the same unserviceable debt fuelled economic collapse trajectories as Greece. In my opinion Spain and Portugal will both exit the Euro-zone within 12 months of Greece leaving. The following list suggests the probable order of Eurozone exits from the single currency based on debt to GDP coupled with the the level of economic contraction to date. Though I have to state that courtesy of ECB bond buying, there is no sign of contagion yet in other PIIGS nations as illustrated by low 10 year bond market yields, all of which are trading at well below 2%, apart from Greece's debt that is nudging towards 10%, though even here it is still well below the 2012 crisis highs of over 33%. The wild card in all of this is Germany for as I originally speculated over 4 years ago (May 2010) Germany may decide to alleviate pressure on the rest Eurozone by planning its own exit. However all this would amount to a desperate belated attempt to buy more time to slow down the rate of collapse of the Euro-zone so as to allow the financial system to better survive a breakup of the whole eurozone. Whilst contagion amongst euro-zone members may be a slow motion affair as countries line up one by one line up for an orderly exit, however the contagion amongst the banking sector will be immediate and europe wide as credit markets could freeze once more even despite ECB money printing that has the potential to accelerate the collapse of the euro-zone as the potential bailout costs for preventing financial armageddon soar far beyond the means of any of the euro-zone member states to cover. Off course the worlds central banks will do their utmost as they did during 2008 and then again in 2012 to prevent financial armageddon by trying to contain the damage through a myriad of means that they are now well rehearsed in such as bank capitalisation's, providing foreign currency swaps, and in the final instance introduction of capital controls and bank bail-ins cyprus style. The bottom line is that it now looks probable that Greece will leave the Euro-zone within the next 12 months, during which time it will become clearer which other euro-zone members will start to formulate their own exits from the perpetual economic depression of the euro-zone. Especially if after the initial pain (inflation) the Greek economy actually does start to strongly recover which could result in a stampede and collapse of the euro-zone. This whole thing has now become so embarrassing I do not know how these politicos can keep straight faces in their many press calls. Greece shouldn't have even been allowed into the Euro in the first place, and how did they think they could lock such wildly divergent economies into one currency and interest rate? I agree the short term consequences of an exit would be very painful, but at least they could then rebuild. If the ECB try to keep this going it will implode the whole thing anyway so they may as well admit defeat now. Nadeem, you previously mentioned your US Stocks article was due a couple of weeks ago. Looking forward to it and hoping it comes out soon! Thanks as always! I hope to complete it this weekend.